One of the most used attachments on a Dingo is also one of the simplest. The Leveller. Sometimes known as a Carryall, it does exactly what each name implies. As a leveller it’s great. Far easier to use than the 4 in 1 bucket or blade. The leveller makes job finishing simple and easy, adding a professional touch to your job. Used For: Materials Handling, Levelling. 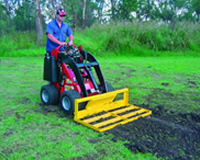 Used By: Dingo Contractors, Hire Companies, Landscapers, National Parks.